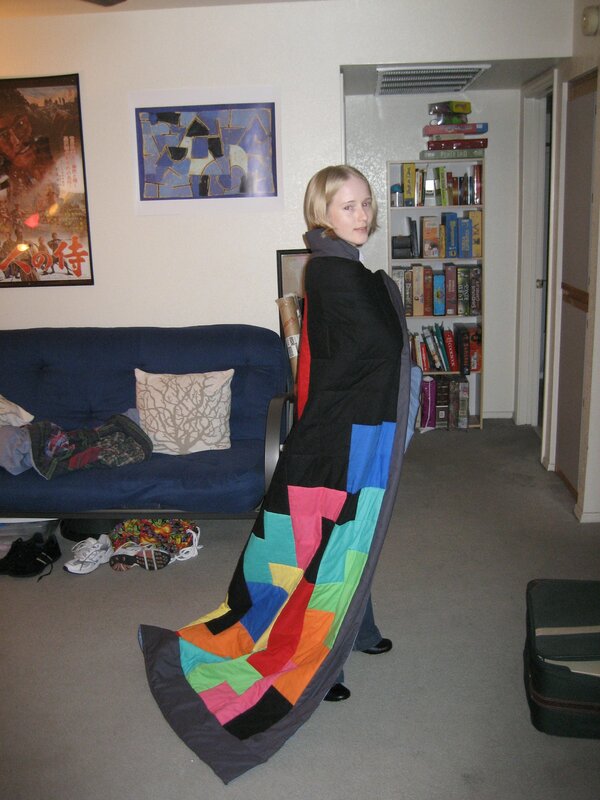 Tetris quilt is done, for reals! 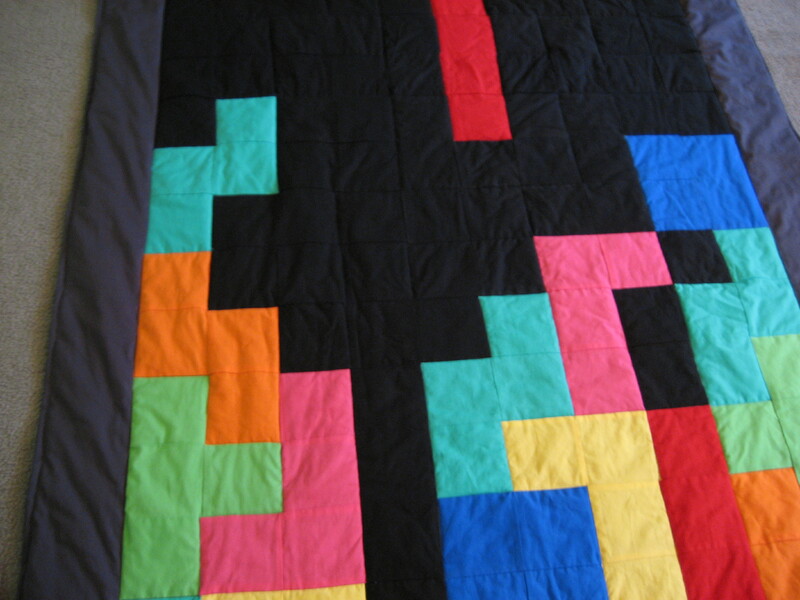 I finally finished my Tetris quilt this afternoon. For a couple weeks all it needed was the edges to be hemmed and I avoided doing it for no particular reason. I took care of that today, so now it is complete. Pieced together, sandwiched with all three layers, quilted to stitch the layers together, and finished all around the edges. Quilt: complete. I think I will wear it as a cape. Update: yes, at some point I’ll get around to reposting the pictures in a size other than gigantic. 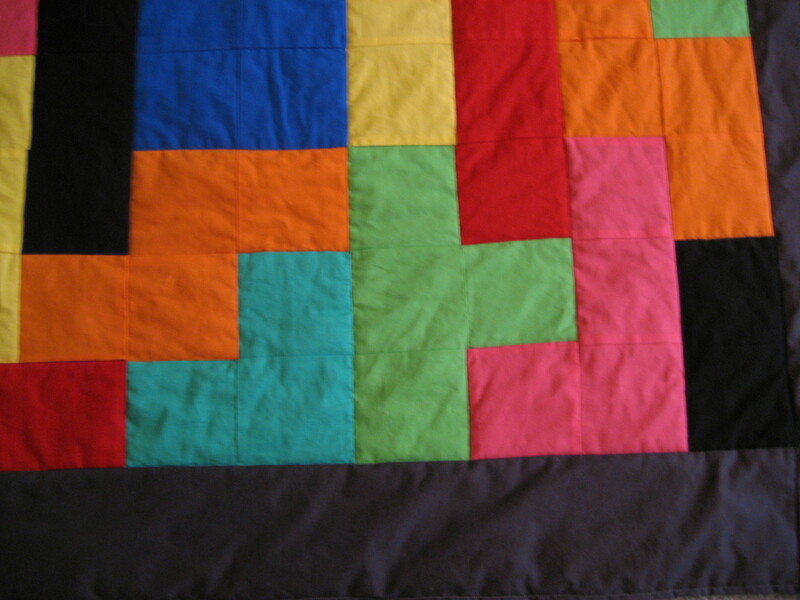 Update 2: The quilt is about 50″ x 72″. Individual squares are 4″ finished. 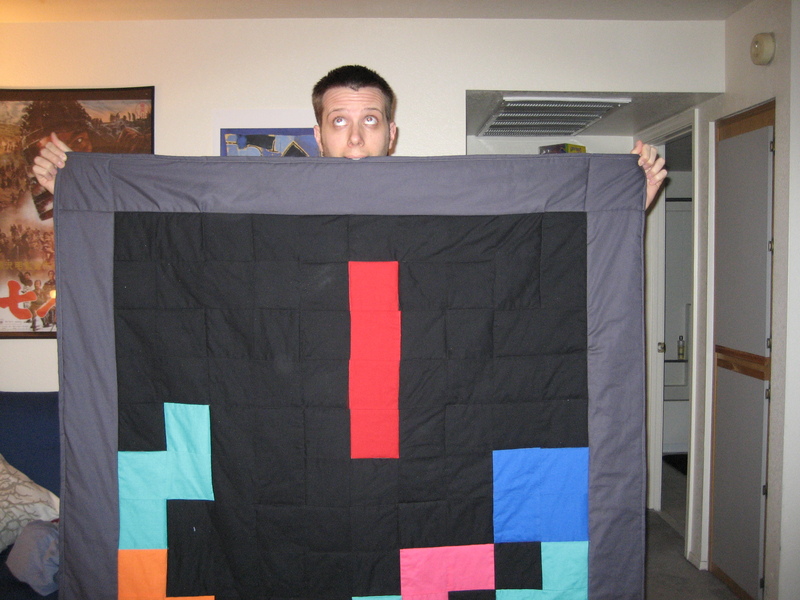 Update 3: I made another one with an all new design, Tetris Quilt 2.0. February 11, 2007. 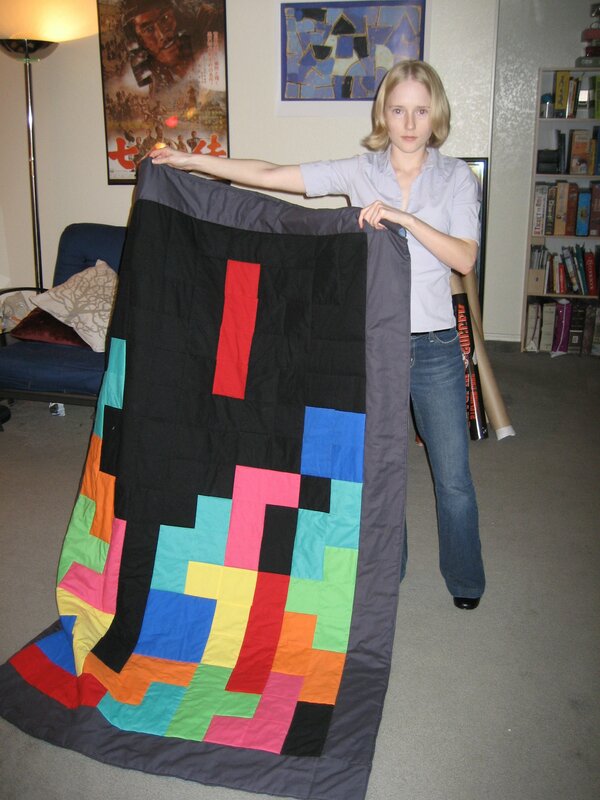 Tags: completed project, quilt, tetris. Pictures, Projects, Words. Not a cape! They get caught in propellers! February 11, 2007 at 11:29 pm. Permalink. October 27, 2007 at 1:41 pm. Permalink. April 23, 2015 at 4:00 am. Permalink. October 27, 2007 at 1:59 pm. Permalink. Oh my gosh, I am so in love with this. Amazing work! October 27, 2007 at 2:36 pm. Permalink. Full disclosure: most of the design was done by my boyfriend. (www.steveswink.com.) I made a few suggestions and small changes, but the credit for the game pattern goes to him. October 28, 2007 at 2:32 pm. Permalink. October 29, 2007 at 2:23 am. Permalink. October 29, 2007 at 2:06 pm. Permalink. October 30, 2007 at 1:56 am. Permalink. November 6, 2007 at 5:01 am. Permalink. Wow, thanks to StumbleUpon, I have “stumbled” upon your glorious ork of art. 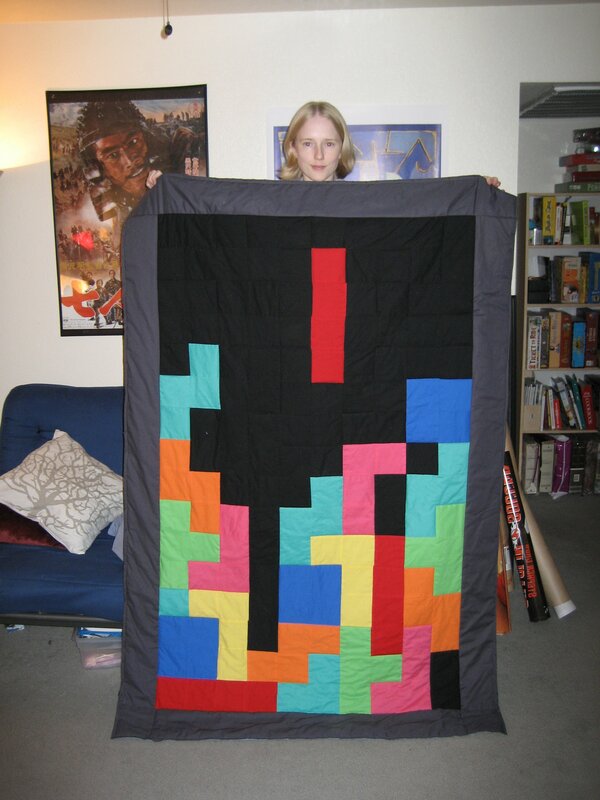 Really though, thats a very neat quilt. I am impressed. Not just at the design and inspiration, but the quality of work as well. You should be proud of yourself. November 6, 2007 at 11:11 am. Permalink. my self-editing skills have indeed LOST…..
November 6, 2007 at 11:12 am. Permalink. November 6, 2007 at 1:49 pm. Permalink. November 7, 2007 at 7:14 am. Permalink. ha. that’s awesome. you should sell them. November 7, 2007 at 11:48 pm. Permalink. YEA I “stumbled” here too…. nice job!! November 8, 2007 at 12:45 am. Permalink. I’m interested in these posts of yours with pictures. However, it takes approximately 37 1/2 minutes to download your blogs when you include them. Any way you could compress them? Also, could you go back and fix all the ‘what I wore to work’ ones, too. I gave up on those really fast, which is a shame because the whole way I found this site in the first place is because I wanted to see some examples of pencil skirts. November 8, 2007 at 3:55 pm. Permalink. Hey! GREAT idea, my mom can do some quilting and I am going to show her, she might try it for me, or teach me how, see, I wanna quilt,cross stitch and make hook rugs… sooo hard because internet tutorials arent that good lately :P:P:P:P Well, AWESOME job!!! December 1, 2007 at 8:07 am. Permalink. December 30, 2007 at 10:25 am. Permalink. AND you have a seven samurai poster, if you can yodel you might be my dream girl. February 13, 2008 at 3:18 pm. Permalink. May 21, 2008 at 6:31 am. Permalink. September 17, 2008 at 10:02 pm. Permalink. I just want to tell you that not only is this quilt an awesome idea, but I love that the long piece is about to drop down into the hole. Very satisfying to look at. 😉 I guess you can tell the Tetris addicts from way back from their response to this. September 20, 2008 at 8:21 am. Permalink. You might want to make those pictures thumbnails and have them link to the originals. It’s crashin mah browzer!!! November 20, 2008 at 8:15 pm. Permalink. But umm. I’m not big on sewing so if I copy you like the jackass I am, it’ll probably end up looking like a mangled lampshade anywho. April 26, 2009 at 9:43 pm. Permalink. September 28, 2009 at 8:41 pm. Permalink. January 18, 2010 at 4:56 pm. Permalink. November 14, 2010 at 6:27 pm. Permalink.